Blanka from Super Mario Klemp-Won-Do: Muskeln sind nicht alles!. Blanka is a beast-like character hailing from Brazil from the Street Fighter series. He is Mario's third opponent in the Club Nintendo comic "Super Mario Klemp-Won-Do: Muskeln sind nicht alles!". The third fight to win "Street Fighter II grand master" starts, and Toad arrives to assist Mario. Mario is given bananas, and he spreads them across the ring's floor. Blanka accidentally slips on one of the banana peels and falls right out of the boxing ring, getting himself disqualified. Blanka was also one of the fighters that laughed at Mario before the tournament started. 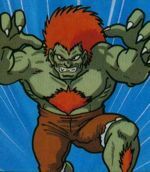 Blanka also appears in Super Smash Bros. Ultimate as a Spirit. This page was last edited on February 26, 2019, at 10:35.